The solo project of former Arches of Loaf front man Eric Bachmann, Crooked Fingers has delivered two full-lengths and a cover EP of melancholy indie-pop. Red Devil Dawn, Bachmann's full-length debut on Merge Records, follows in the grand tradition of prior Crooked Fingers albums, this time around, however, adding strings and horns for a more orchestrated indie-rock attack. Opening with the dark, but hum-able "Big Darkness", Bachmann's pop sensibilities are never put in question, reeling you in by the first note and never letting go from there on out. "Don't Say A Word" mixes acoustic guitars with an airy cello, Bachmann coming across as the older, wiser man telling a story, one you listen to attentively, as he leads you through the moral and offers you advice. The laid back "Bad Man Coming" gently crawls from note to note, Bachmann slowing picking at a guitar while his voice gets deep and brooding, the dark pop background the album's shining point as the grave vocals and simple guitar point to in an eerie, don't-go-down-that-dark-alley direction. However, Red Devil Dawn, for all its melancholy, isn't without its blistering moments, as the warmth, hook-laden "You Threw A Spark" will attest to. The rhythm section picks up the pace as Bachmann chases them, keeping up while he spins a tale, the strings adding a bit of a dark cloud to the song, but the horns coming through like rays of sunshine. The utter contrast is enough to floor you, but Bachmann doesn't hold back, stunning you with a sing-along verse before pulling the rug out from underneath your feet when the chorus hits. 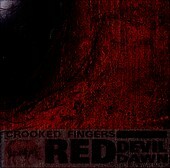 He can be as dark as he wants, or he can be surprisingly upbeat, and that is what makes Red Devil Dawn such a pop gem. Bachmann's melancholic lyrics meet their match at times, while other times they're given an even graver tone when put to the music. If you don't fall in love with the oft-confusing, but always enjoyable mind maneuvers of Crooked Fingers, something has obviously gone wrong, because Bachmann mixes it up enough to sell all those who listen on this record. I'll give it an A.